The male Meadow Pipit (Mow) rises from the ground in a steep, fluttering flight, during which he utters weak "tip" calls. Then he parachutes down again, uttering one long trill. The Northern Lapwing (above) has an erratic, tumbling display, with wild calls. Some eagles (right) perform swoops and dives high in the air. They close their wings to dive, turn up again briefly, and then continue the plunge before finally leveling out. "Pendulum" displays (right) are seen in some birds of prey and some . hummingbird species. The moment a bird takes to the air, it is likely to display vivid markings on the spread wings and tail. These include white or colored patches, bars, or stripes, that arc hidden while the bird is perched. Other birds feeding nearby, often in a mixed-species flock, notice the change in appearance and interpret it as a warning of danger and the need to fly. The pattern also enables each bird to recognize members of its own species, which it will then follow to safety. We, too, arc able to use the pattern, together with details like song or behavior, to identify the species. 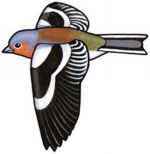 Alarm Signal On taking off, the male Chaffinch reveals a vivid pattern (above). Look for the flash of wing patches. These are panels of a conspicuous, vivid color, as seen on the female Evening Grosbeak (right). 'These are bands of a bright, contrasting color that shim-along the extended wing when the bird is seen in flight, as in the Eurasian Goldfinch (right). In shorcbirds, also known as waders (above), most species have their own characteristic patterns of white on the wing. These marks become visible only when the birds fly. As well as having patterns of white stripes on the wing, some ducks (below) also have a speculum - a white or vividly colored panel located on the inner flight feathers. The families to which birds belong are not always useful as guides to how they will look when seen in the field. A good number of families include birds that arc very unlike one another in vital respects, such as color, shape, habitat, or behavior. This key solves the problem by setting up categories that are not based on family but on habitat and feeding manner. Bear in mind that categories like this cannot be watertight - birds arc living creatures and can rarely be tied down to a single habitat or style of behavior. This means that in some cases you may find it helpful to try alternative ways through the key. 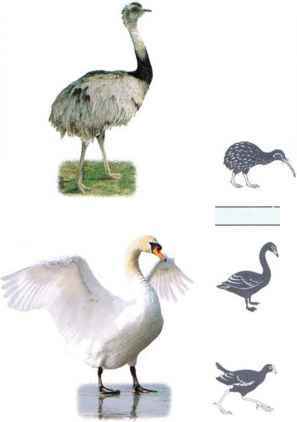 Stage 1 (opposite) divides all birds into five basic types. Choose the relevant one and follow its symbol into Stage 2, where the basic-types are divided into helpful categories. Silhouette images lead from here into Stage 3 (pp. 22-37), giving possible identifications. Birds mostly feeding at the surface; some reach beneath the surface, and some dive to pursue fish or other prey. Mostly surface feeders, though some dive. Some have lobes on their toes as swimming aids. Very big birds, some taller than humans, mostly with long legs and necks. Some live in open country and survive by their ability to walk or run long distances. Birds from pigeon- to chicken-size that live on the ground and hide in vegetation or in burrows; some are nocturnal. Watkrbirds understand this group, turn to the relevant parts of Stage 2 (bottom of pp. ¿0-21) and then look at the examples shown in Stage 3 (pp. 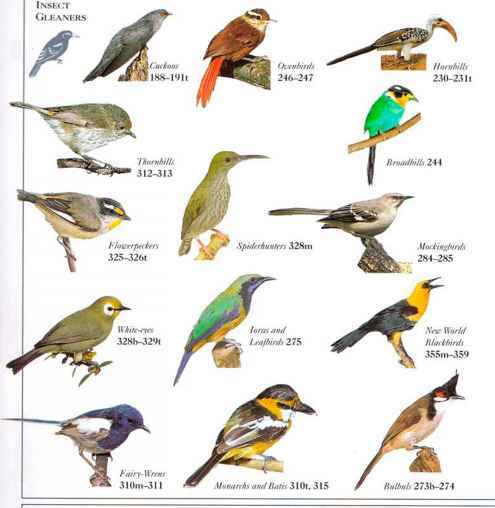 36-31); this will make it clear which birds belong to this category. Ranging from pigeon- to chicken-size, these are birds that spend most or all of their time on the ground, often feeding on seeds but that can fly when necessary. Pigeon- to chicken-size birds with slender bills for probing the ground and feeding on insects. Most of them can fly when necessary.